According to data from the World Federation of Exchanges, world stock market valuation reached a 20-month high of $49.1 trillion in March, the highest level since July 2008. Compared to last March, world markets have gained 55.4% in value, led by strong annual, triple-digit gains from Brazil (102%), India (125%), Turkey (131%), and Japan (104%). 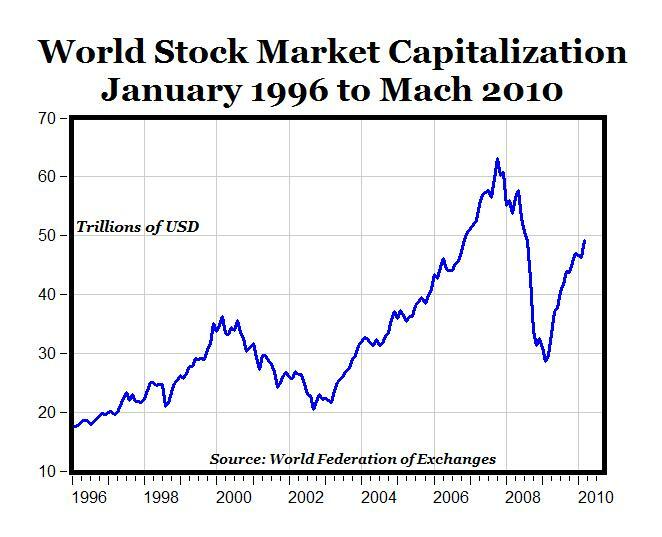 From the February 2009 bottom of $28.6 trillion, world stock market capitalization has gained more than $20 trillion, and has increased by 72%. From the all-time December 2007 high of about $61 trillion, the world stock markets lost about $30 trillion in value in 14 months through February 2009, and $20 trillion of that loss has been regained through March of this year. 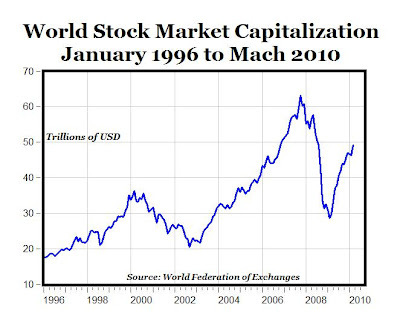 Although world stock market value is still down $10 trillion from the peak, it should be noted that there is $29 trillion more of stock market wealth today ($49 trillion), than in 2002 ($20 trillion). Finally a chart that shows reality. "Robert Shiller, an economist at Yale says the price of a stock has never been the same thing as money — it's simply the "best guess" of what the stock is worth. "It's in people's minds," Shiller explains. "We're just recording a measure of what people think the stock market is worth. "In a sense, $50,000 just disappeared when he said that." "But it's all in the mind." Its in the mind until you cash it. Schiller is wrong about that. The stock market values reflect actual sales of stock; people buying and selling stock. Stock prices are a record of what people have PAID for stock in actual money (whether borrowed or not), and reflect what they believe the value of a company will be in the future. When prices are much higher than the realistic value of the underlying companies, there is a "bubble". When people lose confidence in those high prices there is a market crash. This also applies to the real estate market, as we have seen recently. Shiller's analogy of a real estate appraiser doesn't apply, as no value has actually changed hands. I can SAY something is worth any price I want to, but the only price that matters is the one at which I actually buy or sell. Did any CARPE DIEM reader think and act on the over valuation of Goldman Sachs (GS) stock yesterday (4-16-10)? If you acted on the over valuation thesis by buying GS puts in large amounts then you are one of the richest persons in the world! Check out the uber hyper gains on GS puts. Is Carpe Diem the ultimate contrary indicator? Ron H. said: "Schiller is wrong about that." What if the stock market opens lower and keeps going lower? Your $400,000 of stock is now worth $350,000 (which could happen in a week). How is that different from what the real estate appraiser said about the value of your $400,000 house is now worth $350,000? Gettingrational, one reason why it's difficult to make money trading in the stock market is you may believe a stock is very cheap and buy call options. Yet, it may still fall much lower, stay lower longer than you expect, and then rise sharply quickly. After a few months, you'll be lucky if you broke even on the call options after time value decay. So, you don't know how far it can fall after you buy, how long it'll stay low, and how high it'll go to sell. Similarly, many who believed GS was overvalued and bought puts may end up breaking even. I know people who made a lot of money in the market, and then eventually lost it all in the market (including myself). It's a lot of work for nothing. There are ways to make money in the market. However, I wouldn't recommend to 99% of people they should trade in the stock market. It's a steep learning curve. Anyway, Shiller's explanation is incomplete. The stock market can be driven higher by shifting money from money market funds and bonds; leverage; short selling (causing short covering); institutions holding (i.e. not selling with wide stop losses), etc. PeakTrader said: "Your $400,000 of stock is now worth $350,000 (which could happen in a week). After reading your comment, and rereading your original comment, I must concede that you and Schiller are basically right. It's all in the mind. Stocks are not money, real estate isn't money, in fact, these days, even money isn't money, except that the Feds say it is. I guess my problem with Schiller's analogy is that stocks and real estate don't compare well, although they both may be assets. The stock market, on a second by second basis, may show me millions of prior sales throughout the day for a particular stock, so I can be pretty sure of buying or selling shares at very close the most recent prior sale price. A real estate appraisal may provide me with a half dozen prior sales, over a period of months or years, if I'm lucky. Also, I can be sure that every share of stock is exactly the same as every other share of the same company's stock, but houses most likely are NOT identical, so the appraisal becomes more of an educated guess. California Real Estate Market Past the Bottom?